Time for an update on Mary. It’s been a crazy week. I have sent a few folks email updates but I thought I could do a more complete story by writing it once here for everyone to read. Mary had her shoulder surgery this past Monday. The surgery is called “Reverse Shoulder Replacement“. See the link for more than you ever wanted to know. Apparently there was enough damage to the head of the humerus that it warranted doing the shoulder replacement. The doctor said that if no surgery done, then it would heal but it probably wouldn’t be very useful. 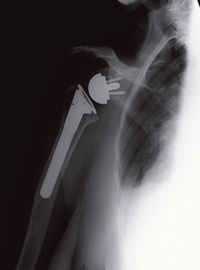 Here’s a typical X-ray of a reverse shoulder replacement. Mary went through the surgery with flying colors. Paula had taken her to the hospital at zero dark thirty. I remained at our condo for our housekeeper to do her work. (She comes every other Monday, and this past monday was her day). So once Alicia left, I was going to the hospital to visit. Not so fast bucko, dead battery. So I called AAA. They came in under 15 minutes. These days the AAA truck carries replacement batteries with them in the truck. So I had the old battery replaced in under 15 minutes. $99 plus tax and I am on my way. The battery in the jeep was original equipment, six years and 100K miles. So while Mary was recuperating in the hospital, Paula and I had a date night. We went to see “American Hustle”, then dinner at local Mexican restaurant. Then on Wednesday, Mary was discharged from the hospital. We got her home and settled in. I think she was happy to be home. Pastor Jacques from Ocean View Baptist Church came to visit Mary that evening. So for the past few days she has been resting and sleeping a lot. She gets up for meals. Sometimes she will watch the news on TV. Last night at about 6PM, she had a craving for a hamburger. So off I go to the In’n’Out drive thru for a burger and fries (no cheese, no onion). I guess she hasn’t lost her taste. Ever since her fall on 12/22, she seems so much more frail. It’s like someone flipped a switch and all is gone. One of the home health aides came to talk with us on Saturday. We brought her up to speed on Mary’s recent health history. Probably starting physical therapy at home pretty soon. Followup with the surgeon next Thursday. She now has got religion about using her cane. Even with the cane, we have to be very cautious. We had a near miss last night. While heading for her seat on the couch, she stumbled and almost fell. Luckily, Paula was there to catch her. Another fall this time would be catastrophic. We feel that we can’t leave her alone for the time being. So that means finding someone to sit for us. So when our children were little we had to find a baby sitter so that we could go out and have some time together alone. Now here we are decades later with the same problem. Is there a word for someone you use for watching over your frail parent? Baby-sitting doesn’t feel right, perhaps grandma-sitting or elder-sitting? This entry was posted on January 19, 2014 at 12:25 pm and is filed under Family, San Pedro. You can subscribe via RSS 2.0 feed to this post's comments. Hope all goes well for Mary K. My recovery has been slow, but steady. Walking without a walker now and got back to my Church and S.S. today. My family has been absolutely wonderful through all this. Many prayers were sent for my recovery and I am thankful for this. Take care of yourselves.